Esther and Lucy’s fight for freedom doesn’t go quite to plan. 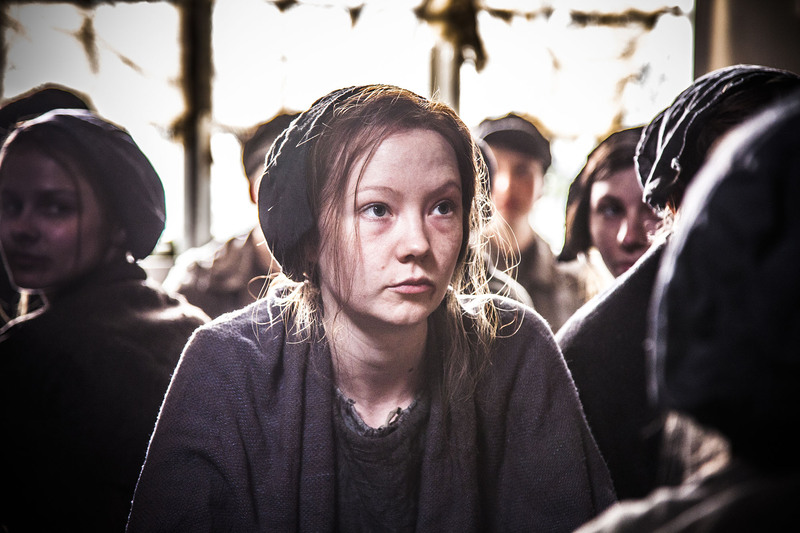 In a very eventful episode of The Mill, the Gregs are confronted with a growing opposition to their work ethics, while Esther and Lucy are forced to face the consequences of their escape to Liverpool. The episode starts by giving the viewers a false sense of hope for the two runaway girls Esther (Kerrie Hayes) and Lucy (Katherine Rose Morley), who’re happily chatting away on the road to Liverpool. The horse and cart they hear behind them, turns out to be Timperley (Kevin McNally) who’s been sent to find them by Robert Greg. The girls however are clever, and are able to continue their escape by taking the horse and cart, leaving Timperley stranded. As they arrive in the city, you really keep rooting for the girls, to find work and shelter, but sadly it’s not to be. When Esther helps Lucy find Catherine in the workhouse, Timperley snatches Lucy away and brings her back to the mill. Shocked to find herself on her own, Esther doesn’t lose track of what she came here for, and starts searching for her birth certificate and family by leaving notes. At the mill Robert Greg (Jamie Draven) is growing more anxious by the day with the threat of the unions on his doorstep. He’s taken action by demanding loyalty of his workers, and sign ‘the document’, losing all rights to join or form a union and any kind of protests. Daniel Bate (Matthew McNulty), the charismatic engineer with links to political activist John Doherty (Aidan McArdle) refuses to sign, and Greg backs down as he needs him to finish work on the new loom. Lucy’s return to the mill and her punishment of having to stay up in the roof, proves fatal to Mrs. Timperley (Claire Rushbrook), who dies of a heart seizure after climbing the stairs. While Lucy has returned, Esther is determined as ever in Liverpool, showing spirit and character – but it is the people around her who let her down. The scene where the Reverend promises to show Esther some documents, was very predictable as he betrays her to Timperley. We already knew Robert Greg to be a horrid character, but his outrageous actions makes him entirely unredeemable. Esther is bound like a slave in chains on her return, followed by a punishment aimed at breaking her self-confidence and character. It’s nothing to do with vanity, but a woman’s hair is very important, it’s part of one’s identity. It’s a very powerful scene when Lucy is forced to cut her friend’s hair, more so as Esther shows her inner strength. Brilliantly played by Kerrie Hayes. It’s a shame that this strong message was followed by a goofy scene as men struggle to lower Mrs Timperley’s body down the stairs. The screams of laughter by the girls wasn’t convincing that this was at all funny… Especially as in the midst, Esther confides in Lucy about Catherine possibly being murdered by Timperley. Between the doom and gloom, there’s romance in the air as Daniel and Susannah (Holly Lucas) become closer. The hints were there last week that these two would end up as an item. Daniel inspires Susannah with a pamphlet and by joining a protest event led by Doherty. Reacting to ‘the document’ and speaking out about the rights to assemble, hoping Parliament will pass the ten-hour work bill. The most unexpected and enjoyable scene, was the impulsive proposal of marriage by Daniel in order to keep Susannah at the mill. Preventing the cart to drive her away, he falls to his knee and proposes to her, there and then. Robert Greg shows his devious and manipulative side once more, as it turns out to be a ploy to bring Daniel into the fold. He allows Susannah and Daniel to stay in the village only if Daniel signs ‘the document’. Choosing love over politics, Daniel signs his pledge of loyalty to the Gregs. It’s a real shame that the series will conclude next week, just when the drama got into its stride. Kerrie Hayes really has to be applauded for her portrayal as Esther, showing courage and strength. Which will be tested in the finale, as she and Lucy will try to find out the truth about what’s happened to Catherine. While Daniel’s new loyalty to the Gregs will be under scrutiny.